The Ecclesiastical Affairs department is one of the oldest and most important departments of the State. In Sikkim, lamas and pundits are the integral part of the society and their services are frequently required for day to day social functions such as marriage, death and birth rites. 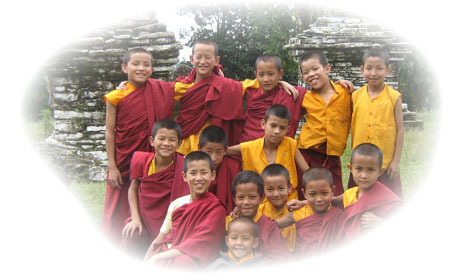 Gonchoe Labtha or Monastic School is a medium for providing basic education to the young monks to become eligible monks. Earlier, there was no system to provide an academic education to the probationer monks except imparting ritual courses after they have been taught for manual reading and writing. Consequence of which made them with poor literary knowledge. In keeping view of this, the Ecclesiastical Affairs Departmen,t encouraged these religious Institutions to open Monastic Schools for the probationer monks to study elementary courses of the academic education for five years. Official records reveal that, the first government aided Tibetan Teacher was appointed at Pemayangtse Monastery , west Sikkim, on 1.10.1958, on the behest of the Duchi of Pemayangtse during the then Monarchy Government. In fact, the monastic education system was started by Late Khachoed Tulku Dujom Dorjee who was then Head lama of the same Monastery. This system was further strengthened by introducing monastic schools in other major monasteries of Sikkim and the number of such monastic Schools reached 81 by the year 2005. Out of the above Monastic Schools, the funding of 50 monastic schools recognized within 1996 was patronized by Human Resource Development Department under grants in aid scheme, till the year 2004-2005. The remaining 31 monastic Schools were patronized by the Department of Ecclesiastical from its budget. With the recognition of these monastic Schools, the State government had committed to provide the facilities such as teachers salary, free text books, uniforms and outright grants for the construction hostel buildings. Initially, the teachers were paid with Rs. 1000/- per month as an honorarium salary. Later the rate of the honorarium salary was enhanced from Rs. 1000/- to Rs. 3000/- p.m. and also provided an annual contingent grant of Rs. 5000/- only to each School with effect from the financial year 2003-04. Again, the honorarium salaries were further revised Rs. 3000/- to Rs. 5000/ p.m. and revised the annual contingent grant from Rs. 5000/- to Rs 10,000/- only with effect from the 1st April 2005, considering on the state of the limited sources of income of the management of religious Institutions.